Drink plenty of water because the average person needs about 2 litres a day. Exercise with an elevated heart rate for at least 30 minutes per day. It will also boost your immune system. Massage the area with an ointment of your choice to promote blood flow to the area. This has the added benefit of moisturizing the skin and improving its overall condition so it is prepared for your next treatment. Keep in mind that you need to wait until the skin is visibly healed post-treatment before doing. For faster fading and healthy skin after the tattoo removal procedure, do these recommended tips for faster tattoo removal treatment recovery. It’s important to establish upfront that tattoo removal is a process that relies on the body’s ability to eliminate ink from the skin. It’s not unusual for the body to take over a year to completely eliminate ink. If you experience blisters after the tattoo removal procedure, be careful not to pop or pick at them. Even if you are careful, blisters can open on their own. When this happens, treat the open blisters with antibiotic ointment and cover them with a clean bandage to help prevent infection. Choose a doctor or a specialist, who is knowledgeable about laser tattoo removal. After consultation, the doctor should be able to tell you whether or not the type and colour of your tattoo can be removed with the lasers in the tattoo removal office. A waiting period is recommended in between tattoo removal treatments. After the laser fragments the ink the body absorbs the particles through your natural immune system. Treating a tattoo more frequently is premature and the body will not have had enough time to process the ink. 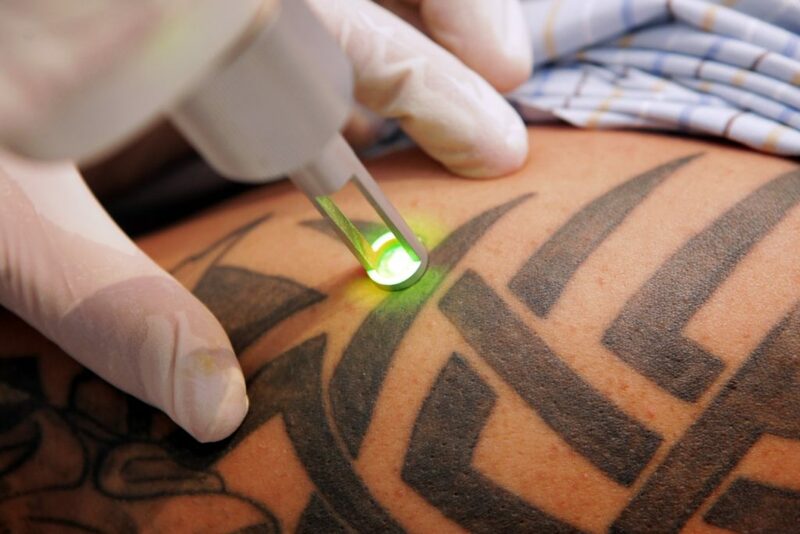 When in the process of laser tattoo removal, different colours of ink require lasers of different wavelengths. Black tattoos tend to be the easiest to remove in the process of laser tattoo removal. The laser tattoo removal has a sensation that is often described as the feeling of an elastic band snapping repeatedly against the skin, and is said to be more intense than being tattooed, though a single laser tattoo removal session is usually completed within a few minutes. Use only petroleum jelly, then cover the area with gauze and surgical tape. Depending on how well and fast your skin heals, this may be required from three to seven days. Half the work done in laser tattoo removal relies on your body’s natural ability to heal. Keep your body healthy by eating and drinking right for a faster laser tattoo removal process. Healing time between treatments is typically 6-8 weeks. During this time, the following before and aftercare instructions should be followed. This will help create the best results. Ensure there is no direct sun exposure before and after laser tattoo removal treatments. Use sunblock with an SPF of 30 or higher over the treated area during your series of treatments. It is also important to reapply your SPF every two hours if exposure to UV rays will be an extended period of time. Do not expose the treated area to water for at least two to three days after the treatment, or until the area has completely healed. Sometimes this can take up to seven days. prevent any harsh pulses of water from touching the affected area. Submersion in water should be avoided one week after your treatment. This means avoiding bathing, hot tubs, swimming pool and saunas. Check with a laser tattoo removal specialist before undergoing one. With the popularity of tattoos, there is also an increase in the numbers of those seeking different methods to remove their unwanted artwork which is a laser tattoo removal session. Laser tattoo removal uses powerful energy to shatter the pigments, or inks, within a tattoo into tiny particles which are then easily removed. If you are considering laser tattoo removal, you will meet with a dermatological surgeon for a consultation to discuss your goals and also discuss your medical history, including previous surgeries, present and past health problems, medications, as well as nutritional and herbal supplements you are taking or have taken. Many people are concerned about the risk of scarring when undergoing laser tattoo removal. Luckily, most people do not form scars after laser removal treatment. If you do happen to experience this side effect, there are a couple of things you can do to minimize the scar tissue. Many people have had success with this technique, although there isn’t any official research that measures the efficacy of this approach to scar treatment. You also have the option of silicone scar patches, which are available over the counter. Hypopigmentation and hyperpigmentation are possible side effects from a laser tattoo removal. If you do notice darkening or lightening of your natural skin colour, you’ll want to wait for it to pass on its own. It may take months or even years to do so, but in most cases, the skin will regain its natural tone after the treatment site has completely healed. Laser tattoo removal will not create much pain. The patient will feel some sensations around the treated area but the pain is minimal and will only cover a limited amount of time. Though, most people get a laser tattoo removal with the use of the technology and stress is basically minimal and at most times, laser tattoo removal specialists will offer materials in order to deal with the swelling but swelling do tend to disappear quite fast.